Before WSR, there was a 4:3 picture tube. After WSR, there is a nice 65 inch widescreen rear projection TV. However, it's only a beginning, because WSR started a dream. The reality looks crisper and clearer now, even the sound is more precise and enveloping. 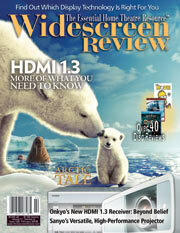 Widescreen Review: P5/S5, one's critic’s composite: 5. Thank you, WSR. Keep up the excellent work!